Click to enlarge. Top row left: front view. 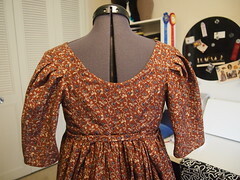 Right: bodice detail. Bottom row left: back. 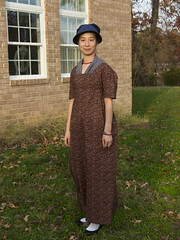 Right: wearing at the Regency Pumpkin Tea in 2012. Notes: Made fall 2012. 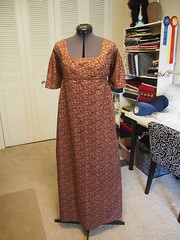 Entirely hand sewn except for the long skirt seams. 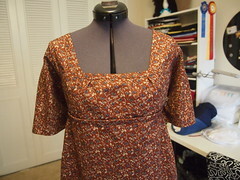 I got the brown fabric for $9 at The Scrap Exchange in Durham, NC.